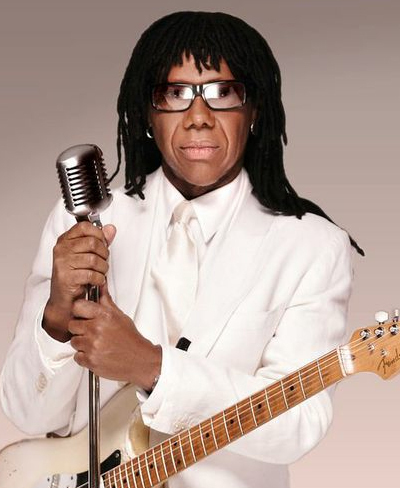 NILE RODGERS has written, produced and played on a lot of the most memorable Pop music of all time. After his initial success with his band CHIC (Good Times, Le Freak), Nile and his CHIC partner, Bernard Edwards, wrote and produced the biggest selling albums for Sister Sledge (We Are Family) and Diana Ross (Diana w/ Upside Down and I'm Coming Out). After his success with The CHIC Organization, Nile went on to produce, compose and/or play on some of the best-selling recordings of all time, including music for David Bowie, Daft Punk, Duran Duran, Madonna, INXS, Mick Jagger, Peter Gabriel, Britney Spears, Joss Stone, Maroon 5, Coming to America (Soundtrack) and many more. Now a cancer-survivor and successful author, Nile continues to break ground producing and releasing music for critically acclaimed video games, Halo (Series), Gears of War as well as Pop, Rock and Dance musicians world-wide. Nile Rodgers, with his ever-evolving CHIC Organization, are still very active touring the world and bringing smiles, music, dance and "the funk" to people of every age.